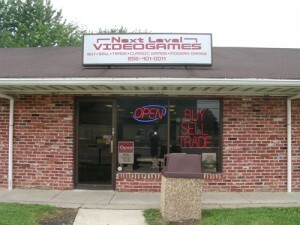 Thursday after class I drove southeast to visit my friend Nickâ€™s store, Next Level Videogames in Blackwood, New Jersey. And you know I kept this entry around in my feed reader while I considered what struck me. What struck me is I fundamentally do not understand many types of stores anymore. I may sound like I’m being dramatic, but I am not kidding here – the thread of internal conversation that would eventually lead to “and you would then fill a building with a very specific kind of stuff and wait for people to show up and buy the stuff” is one I quickly have lost. Why have a store? Well, if you were, say, a place where you did stuff to people, like a tattoo parlor, dentist or laser-eye surgery pit stop, then yeah, you’d want this building where you go in with your equipment and wait for people to show up and do things to them. Got it. Food, another good one. You want food, you go to a place where they cook the food and even then you probably want to dress up the food a bit, but fundamentally, hey, come get food here and we will wait for you to come get food. Supermarkets. Mega-box stores. Got it. Why do we need vacuum-only stores? Why do we need piano-only stores? Why do we need stories with a lot of something and those stores have to wait, patiently, in one location while people come in and buy that one thing, often doing so based on a criteria not relevant to the expertise of the person? It’s just starting to seem to desperately archaic to me. If the situation does exist, and of course it does or these places would be entirely gone, I feel like it’s some kind of charade, an agreed-upon fiction like a post-apocalyptic world where we still get “the mail” delivered because we’ve always had “the mail” and even though there’s no one left to send us mail, we still have a mailbox outside. When the bookstores started dying in droves, some of them didn’t go into the good night entirely quietly. There was one in Boston, and I just don’t have the heart to poke them in the eye, who wrote a variety of scathing indictments of the modern era, blaming the Internet and people not knowing a good deal in a used bookstore for their demise.Â I’m sure they thought they were taking a stand at the time (this was 7 years ago) but the fact is I knew this store and they were a cranky crypt of off-putting gatekeepers, scowling as they took your money for their books. A lot of stores really seem to be this way. I guess I could see stores that have been around for years continuing along, in a sort of death march, with some specially built-up group of customers who they’ve been cultivating for a long time. Like a floating island in a desert, they are of a special time and place and will go on for a bit. But honestly, I don’t know how someone says “the best way for me to sell this stuff is to go into a building, deal with the endless hassles in today’s over-licensed and over-regulated world, get everything working, go into debt, open the door and hope like hell I make more than $3000 in the next 30 days.” Like, now, in the present day. I understand the romance of it. A place of your own, a store you run. But somehow, the very idea of sitting in a box somewhere deep in the middle or outskirts of a town, waiting for someone to walk in and not shoot me or just browse… I don’t get it. Not now. 1. A store enables multimodal interaction.. I can hear the actual piano and feel the touch of it, may be even smell it………If i am buying a piano i would want to go to the store….. The place Jay is referring to, I believe, is the infamous Avenue Victor Hugo Bookshop that was on Newbury Street in Boston. Jay doesn’t have the heart to poke them in the eye, but I do. Let me be clear: the guy who ran it was a douche bag. I think he read too many Victor Hugo and Alexandre Dumas novels because he actually resembled the villains from those stories. Jay nailed it when he referred to them as “off-putting gatekeepers, scowling as they took your money for their books.” When I was an undergraduate at a college a few blocks away, I went there many, many times and purchased classics, and I remember that virtually every time I asked the man I refer to above for help, he gave me that half-dismissive, half-patronizing expulsion of breath before deigning to help me find the book in question. The guy so clearly didn’t want to part with a single book in his collection; it was as though they were part of his soul. The plight of Avenue Victor Hugo Books is a great demonstration of the need for businesses to adapt. A handful can position themselves as bulwarks against the onslaught of modern society, but to do that they really have to have a unique value proposition–something from the Old School that you absolutely can’t live without. A used bookstore wasn’t it. Wow, two web entries mentioning me in a row? YES, that mind control kit I built using plans I found on textfiles.com is TOTALLY WORKING. How deliciously ironic! Ok so … I get the idea of hating brick and mortar stores. For the most part I hate them and I wrote a weblog not too long ago questioning the logic of a certain video rental chain who just moved into town and opened two new locations, and how I couldn’t believe anyone would be doing that in 2009. So for lots of stuff, I agree, it doesn’t make much sense. The stores I see thriving are the ones that hire or are owned by experts and specialists. You are right, I can buy Xbox games anywhere (and probably cheaper online). But product aside, Next Level Videogames is run by a guy who knows more about videogames than the majority of even videogame collectors. The guy is a walking encyclopedia of videogame knowledge. Visiting a store like that is more than just, “Do you have the latest version of Madden?” At Next Level Videogames you can ask things like, “I played this one game ten years ago that was yellow and had a blue guy jumping around and being chased by red spirals. What was it, what system was it released for, and are there any games like that out there today?” It’s that kind of knowledge that makes those places worth visiting. Yes, that knowledge is probably available online too, if you know where to look and who to ask. Think of it as the equivalent of finally reaching a live operator after being stuck in one of those automated call center nightmare systems. There are other reasons I think physical versions of certain store genres (including videogames) will remain for some time. The ability to talk to a real live expert is one; the ability for a collector to physically search and dig for things is another. And while it makes sense for certain types of stores, I’m as with you on vacuum cleaner stores as I’m sure you are with me on video rental stores. The problem with giant retailers (ie: Circuit City) is they sell (sold) so many different things that nobody in the store is an expert on any of them. Sure, one store may have the occasional A/V snob and another one might have a particularly helpful computer nerd, but for the most part they hire people at or slightly above minimum wage to stand around and harass me as I try and shop. So in a sick way I can almost understand Mr. Vacuum Guy and his little store. I mean, if you need a vacuum cleaner and you don’t shop online and you have some questions about vacuum cleaners, then that’s definitely the guy to go to. Likewise, if you want a piano and you don’t know what you want and you don’t want to pay a bazillion dollars shipping, then maybe yeah, I could see it. In our lifetime I think having a physical location will be the exception to the rule. Maybe someday stores will have “virtual locations” like in Second Life where you can virtually roam, look through stock, have questions answered and things mailed to you. I’m for anything that lets me do more while wearing less. Not to repeat Flack, but he’s got it right. Funny you should mention vacuums, as there is a vacuum store right around the corner from my house. So when we needed a new vacuum, we figured we’d check it out since it’s a local store and it was so close. Turns out the people in that store know more about vacuums than I thought possible. So on the one hand you get to pick the brains of the experts, and on the other you get to try out different models there in the store to see which one you like. Plus, they do repairs there as well, and I would trust them to repair a vacuum more than anyone else. You just can’t get that kind of service at a big box. It’s more expensive, yes, but we think it’s worth it. I don’t think things are quite so dire for these stores, at least some of them. If I want to go and buy something that you want to see first, or you want an expert present to help you with the purchaseâ€”like a piano, or a carâ€”then having a physical store makes sense. There can also be situations where a store can sell something in the quantities that lots of people buy for a lower price than ordering online plus the cost of shipping. I imagine alcohol for most people is one of those. Or say a specialty food store. I also have to wonder what will happen with the cost of shipping in the future. Ordering online in a quick, easy and cheep way only goes so far if the cost of gas goes up. Yes that would bring up the cost to bring very large quantities to the store as well, but not to the same amount per unit as a courier would have. why have a specialty store? BECAUSE they probably are the best place to go to when you want something good! I, for one, look forward to the demise of the Auto Dealership. In my experience, shopping for a new car ranks up there with dental work. Why can’t I go to a website, pick all the options and colors that I want, arrange for financing, then in a few weeks someone from Ford or Toyota delivers the car to my house? Give me a price, one set price, no haggling, no special offers, no endless trips to “talk to my sales manager” BS. My dad took me to a mom and pop plumbing shop, driving past 2 big box hardware stores to get to it. He told the owner what he needed, got the part and was back in the truck in about 5 minutes. It was a $1 part, where the big stores didn’t sell it separately and was part of a $35 kit. I noticed Ritz/Wolf Camera was filing bankruptcy. My coworker is a photographer who was surprised. At those stores, you are paying for expertise. Need a DSLR camera today? Study on the interwebs. 10 years ago- the same exercise meant going to a store to ask some one. Finally… Chris- Saturn did exactly what you explained. Saturn had the no-haggle sticker, you could arrange financing and have the car delivered to your house as you sign papers. The salespeople made Saturn… the cars were unremarkable. It may get to where there are no dealers. Dealer networks cost a fortune. The Chinese may sell direct to customers and farm out PepBoys/Sears/NTB for warranty repair work. Something that drives me nuts more than specialty stores is the concept of retail “seasons” that goes along with brick and mortar stores. I suppose it makes sense if you’re a 1950s housewife, but to me this concept has always meant “no, you cannot purchase what you want when you need it”. Every time I go to try and buy a coat, or a pair of gloves at a traditional department store, they have none and whoever I ask about it acts stunned. Gloves? A coat? You can’t buy those things when it’s actually cold out! You have to buy them months before like everyone else. When it’s cold out, you can only buy warm weather clothes, because that’s what’s “upcoming” so “that’s what people are shopping for now”. It’s amazing to me to have this sort of reasoning explained face to face by some robotic salesperson who doesn’t seem to understand that you can order anything online, and you’re doing them a favor by being there because you happened to drive by and not vice versa. I may be a bit of a dinosaur or maybe just oddly shaped, but I find clothes and shoe shopping moderately less frustrating in person than I do on the web. If I can touch it and try it on, I know immediately if it itches, ihas horrible tags that scratch, squishes my toes or if it’s at all flattering. Plus, I can get another size in about 60 seconds, without having to incur the cost of return shipping. I love the “other” Chris’s comment about getting rid of car dealerships. More douche bags. While not exactly the same as a place that only sells/repairs vacuums, I have to say that I love the stores that sell nothing but appliance parts. I can walk into the store with the make, model, s/n, and a little description of the problem and the person at the front counter can usually narrow down the part I need quickly. More importantly, the person will usually give a few pointers such as be sure that you pay attention to the way the belt fits xyz or be sure that you clean or replace part abc before you reassemble since you already have it apart. Sure, I pay a couple of dollars more for the part, but the knowledge is invaluable. Jason, you’re right about a lot of things, but you couldn’t be more wrong about this one. There are a wide variety of (mostly expensive) things that I could not imagine buying without physically handling. Reviews on a website can only go so far, and you’ve got no idea if the people writing them were idiots or shills. On the other end of the spectrum is the small stuff that’s not worth it to pay shipping for. Then there’s the fact that specialized shops are often run by people who are crazily experienced in the field, and rely on repeat business stay alive, so they’ll find the perfect product for your need, and are usually extremely helpful when stuff breaks down. This has been wholly informative and educational. As I indicated in the entry, I definitely saw that some products and services need a static location, like restaurants and supermarkets. After that, it gets a bit fuzzy for me and it’s starting to get fuzzier with each passing year, which was what I was trying to get across. The gang seems to have made it clear to me that among those things that still could use a static location are “places where you have to touch or hold stuff in your hands and/or where you want to have a conversation with someone who knows their stuff while handling these things.” I dispute the direct need for an expert to be in just one location (an online expert, assisting you, would also be effective), but I can definitely see where coming in and being shown physical items would out-do an online catalog… for now. But OK, a vacuum cleaner guy, a REALLY GOOD vacuum cleaner guy, and his room of vacuums might still have a place. But I can’t help feel that even that guy is not as necessary in 10 years, for better or worse. I can certainly understand your line of thought in wondering why certainly specialty stores still exist. I do as well. Even ones that can be very useful when you have a problem. I didn’t want to throw away a vacuum that has worked well for nearly 20 years. It merely had a broken belt, and was difficult to find bags for. I sought out a local specialty vacuum store. It turns out there was one in a strip mall not 3 miles from my apartment, that not only I did not realize was there, but also had a full web site offering a discount coupon for parts. I printed it off and paid a visit. They had a very wide selection of parts, bags, and plenty of demo vacuums in store for testing purposes. Prices were reasonable for the belt and bags I needed and the coupon was accepted with no hassle. A good experience, I have no idea of how well this place may do financially. I do know that the strip mall in which it is located in, isn’t much more than 10 years old. So this isn’t some relic from the 50’s still standing solely by its own momentum. The second example is this. Several years ago I met the proprietor of a small shoe repair business. A shoe repair business had been in the same location for years, several of which it spent as a closed store front that he had taken over around 20 years earlier. Many of the features and equipment in the store dated to the late 50’s early 60’s. This store was also in an area that was heavily populated by orthodox Jews who were very loyal customers. He made keys, sold shoe supplies, and rented part of the front of the store to a retired man who repaired jewelry a couple of days a week. He had one other employee, who more or less helped out as a hobby. Even with a good local customer base he was still forced to come to arrangements with various dry cleaner locations in the metro area. Some of these as far as 75 miles away, to collect and deliver shoes for repair or cleaning to keep enough business to cover his expenses and turn a profit. In mid 2007 he was hospitalized after a brief illness while visiting family several states away, and quickly succumbed to it. The speed at which this business unraveled and disintegrated was astonishing. All his dry cleaners immediately found other vendors to service them. The dry cleaning business next door also immediately started offering shoe repair drop off. There was no family member willing or able to take over the business, so it was shuttered, the equipment removed, and the store sits empty to this day. 20 years of building a business, and building momentum gone literally within days. A very sad end. I couldn’t imagine trying to start up such a business like that today in this economy. Not unless you were running it as a pure hobby and making money with it wasn’t an issue at all so much as using it as a way to fill your time out was. Specialty stores of various kinds will undoubtedly continue to exist, but I really feel for their owners. You have to be darn sure you’re going to fill a niche that’s under served, have a good location, or provide the kind of service that people seek out and will travel to you for or you may quickly find yourself doomed to failure. Even with the best of luck how many of these specialty stores are one disaster from failure? I’ve been thinking about this lately too. I am amazed for example that there are actually bicycle stores anymore, when one can get them online or CL etc for way cheaper. But then there is such a thing as having a physical life. Going places, stores, restaurants etc. I found in my severe delving heavily into the web for the last ten years that my “real” life really suffered as a result. I know where to get anything online, all kinds of technical/informational things, but no people for the most part. I think a lot of the web results in a lot of people sitting around by themselves all the time. I understand specialist retailers in a fairly compact urban setting: I’ve seen that in cities like Amsterdam. I treasure the people who sell and repair appliances in the US, because they tap into an older model of sales and consumption I respect. And there are still areas where that survives: the sewing machine shop, in particular, remains tied to that kind of relationship. What I don’t quite understand is how specialist shops survive in the US, especially when (like so many) they’re run out of tiny strips or converted homes on slightly hard-to-find highways. Long-standing relationships surely matter, as Greg G said, but it’s often hard to tap into that local knowledge — something where the web might actually help. Right now, you often have a bizarre situation where, for time-sensitive retail missions, you’ll go to a megamart or big-box store and pay Big Box rates for something not quite what you want, all because you never knew about the small place up County Road 141 run by someone with 25 years of expertise and just the right bit of kit. I want a website to tell me it’s there, and I don’t mean “SmallPlaceUp141.com”, because some places don’t need their own site and domain — I just need to know an address and see a thumbs up from people. Local guides are better than they were, but they’re still not as good as they could be. I talked to the fellow at Know Knew Books on California Avenue in Palo Alto, CA — a warren of bookcases, much picked-over but with a few gems — and as he was tapping away at his computer, he said that much of his business now comes from Internet orders. A desert island with a bridge to the 21st century.